Cleveland also known as “The Forest City” and “The Rock and Roll Capital of the World” is home to nearly 400,000 residents. 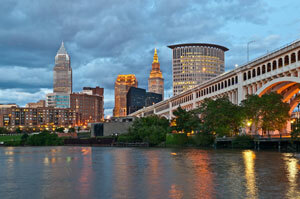 Downtown Cleveland is divided into several districts allowing for differentiated advertising campaigns. These districts include the financial district, home of the Civic Center, and the Cleveland Theatre District, which is home of the Playhouse Square Center. Any sort of out-of-home advertising around these notable locations would allow high traffic exposure of your business. There are also several major highways that service Cleveland. Billboards along Interstate 71, Interstate 77, or Interstate 90 would be another effective advertising strategy for Cleveland. Tourism is also another large industry in Cleveland. The Rock and Roll Hall of Fame is in Cleveland and along with its stadiums for major league baseball and the national basketball association, Cleveland offers the opportunity to reach these visitors with advertising and digital signage around these tourist hot spots. Zip Codes: 44101, 44102, 44103, 44104, 44105, 44106, 44108, 44109, 44110, 44111, 44112, 44113, 44114, 44115, 44118, 44119, 44120, 44121, 44124, 44125, 44126, 44127, 44128, 44129, 44130, 44134, 44135, 44143, 44144, 44177, 44178, 44179, 44181, 44184, 44185, 44186, 44188, 44189, 44190, 44191, 44192, 44193, 44194, 44195, 44197, 44198, 44199.